Volunteering plays a key role in addressing major global challenges, such as urbanization, environmental degradation, increased migration, and demographic changes. Yet in a world of competing political priorities, ‘ volunteering infrastructure’ – the support provided to maximize the potential of volunteering - rarely receives the attention it needs. 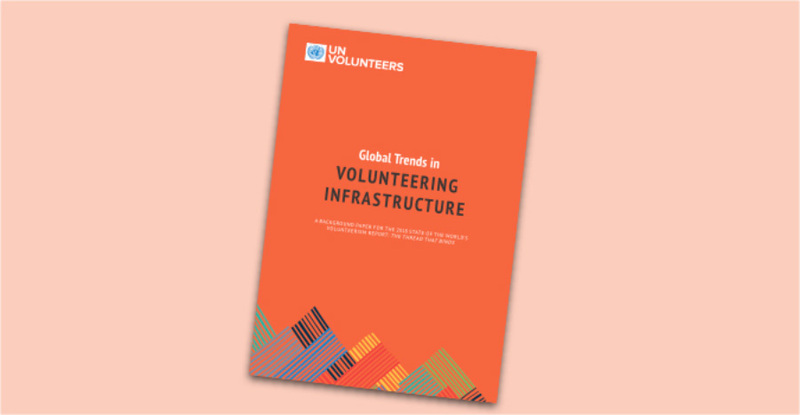 Today, UNV publishes a background paper as part of the 2018 State of the World’s Volunteerism Report project, that looks at global trends in volunteering infrastructure and makes the case for prioritizing a functional, appropriate and inclusive volunteering infrastructure that enables citizens to become agents of change and drivers of their own development. In conditions where policies and legislation successfully create a nurturing and enabling environment for volunteering, people are endowed with stronger protections and incentives to engage in voluntary action. When carefully designed and implemented, volunteer schemes can empower people to participate in their own communities to meet development objectives. As part of the background research for the 2018 State of the World’s Volunteerism Report The thread that binds, the paper, Global Trends in Volunteering Infrastructure, provides an overview of the state of volunteering infrastructure globally. The main global trends identified are the continued expansion and consolidation of volunteering infrastructure; innovations in technology, modalities and partnerships; and new support for inclusion through volunteering. The key trends are also matched with challenges that show the tensions and contradictions inherent in volunteering infrastructure as affected by the context and the available resources. The paper highlights that not all volunteering infrastructure is positive and that some interventions can have negative consequences for volunteerism by being restrictive, repressive, and exclusive. These tensions also indicate ways of reducing obstacles to cooperation and fostering greater inclusion by committing to equality, promoting new forms of cooperation, and incorporating technological and cross-sector innovations. They also suggest a need to balance top-down and bottom-up approaches with greater respect for local traditions, along with a need to better tailor volunteering infrastructure to national and local contexts.